1,481 pages of CIA created and/or maintained documents concerning Klaus Barbie the Nazi war criminal, also known as the Butcher of Lyon, archived. The documents in this collection includes CIA files, State Department messages, German language SS personnel files, published materials, declassified documents, interrogations, confidential reports from agents or informants, and CIA analytical reports. Klaus Barbie, the "Butcher of Lyon", was born on October 25, 1913. In 1935, he joined the Sicherheitsdienst (SD), the special security branch service of the SS, which acted as the intelligence-gathering arm of the National Socialist Party. He obtained the rank of SS-Hauptsturmführer (captain). As a Gestapo member he became known as the "Butcher of Lyon" for having personally tortured prisoners of the Gestapo while stationed in Lyon, France. He oversaw the capture of Jean Moulin, one of the highest-ranking members of the French Resistance. It is believed that Barbie personally tortured Moulin to death. In April 1944, Barbie ordered the deportation to Auschwitz of a group of 44 Jewish children from an orphanage at Izieu. Some historians estimate that Barbie was directly responsible for the deaths of up to 14,000 people. After the war, United States intelligence services employed him and later helped him escape to South America. Barbie is suspected of having a hand in the Bolivian coup d'état orchestrated by Luis García Meza Tejada in 1980. After the fall of the dictatorship, Barbie no longer had the support of the government and in 1983 was extradited to France, where he was convicted of war crimes and died in prison on September 25, 1991. Klaus Barbie 201 Name File. The Central Intelligence Agency, formed in 1947, inherited intelligence operations and agents in Europe from several organizations that had succeeded the OSS after it was disbanded in 1945. By the late 1940s, the U.S. Army's intelligence unit the Counter-Intelligence Corps (CIC) had established many agent networks within the European occupation zones, and extended into Eastern Europe. These networks employed numerous agents, some of whom had tainted wartime backgrounds. The CIC in Germany, for example, recruited as an agent and sheltered Klaus Barbie. The Army smuggled Barbie out of Europe, thereby enabling him to escape justice for over 30 years in his South American hideouts. In the spring of 1947 a CIC agent named Robert S. Taylor from CIC Region IV (Munich) recruited Barbie. 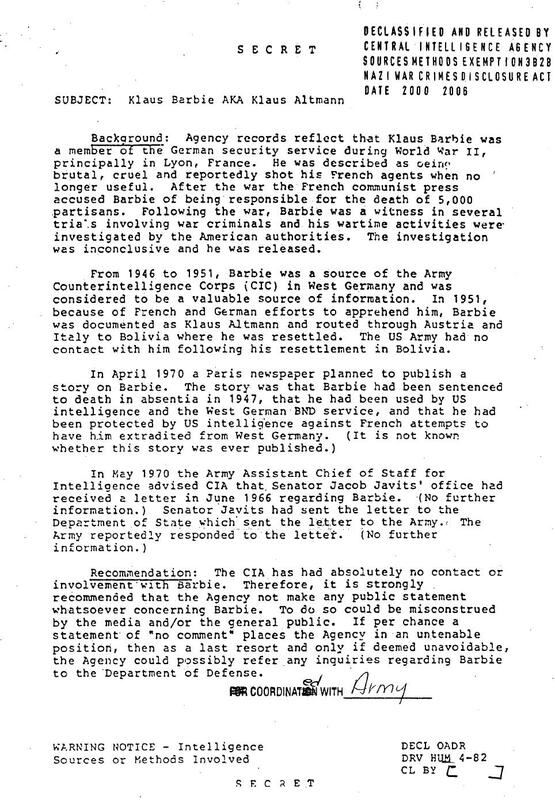 Barbie helped run a counterintelligence net named "Büro Petersen" which monitored French intelligence. In 1948, Barbie helped the CIC locate former Gestapo informants. In 1949�50, he penetrated German Communist Party (KPD) activities in CIC Region XII (Augsburg). Unaware of Barbie's initial hiring in 1947, CIC headquarters was ambivalent about retaining him. Regardless, he continued to work for the CIC in return for protection against French war crimes charges. The story of his escape to South America with the help of the CIC, after French authorities began to make inquiries as to his whereabouts in 1951, came to light after he was returned to France in the 1980's. 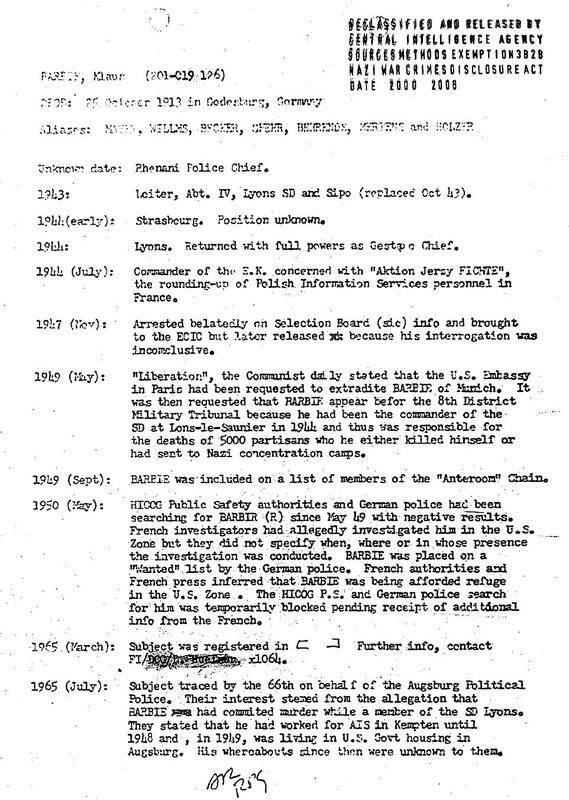 The CIA's name file on Klaus Barbie, the Gestapo official widely known as the "Butcher of Lyon," includes copies of wartime German documents, substantial numbers of U. S. Army and State Department documents, copies of press stories, congressional inquiries, material about a Justice Department study of Barbie, and internal investigations by the Army and the CIA itself over alleged ties to Barbie. 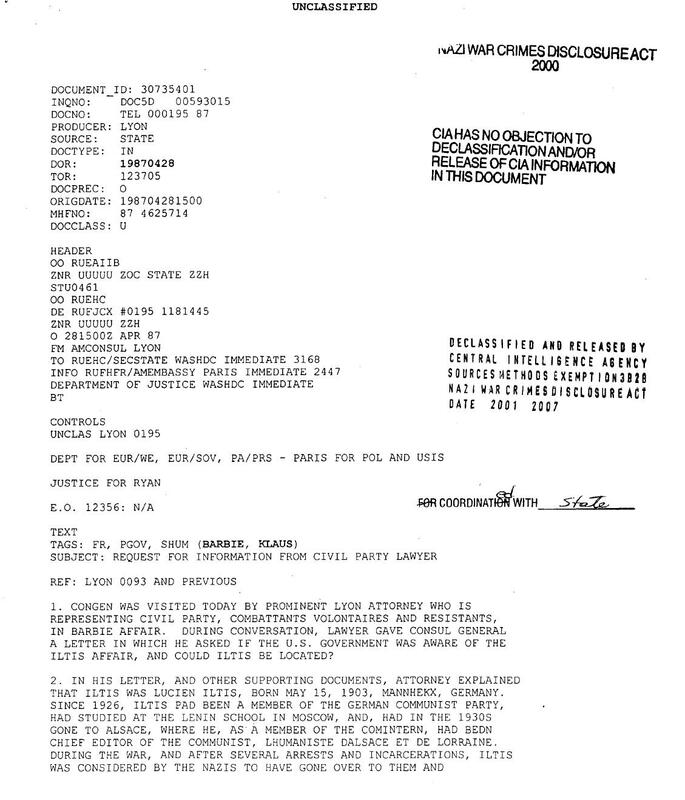 The basic picture emerging from these documents is that the Counterintelligence Corps (CIC) of the U.S. Army protected Barbie after the war against French prosecution and helped him reach South America. As Barbie's escape gained notoriety in the 1980s, the CIA undertook a detailed examination of whether it might somehow be indirectly linked to Barbie. There were some reasons for concern. Bolivian intelligence had used Barbie as a source, and some Bolivian officials may have passed on some of his information to local CIA officials. Also, a CIC unit was connected with, or served as a front for, the Office of Policy Coordination, which became part of the CIA in 1950. The CIA feared that someone looking back at events before 1950 might mistakenly think that Barbie had a connection with a CIA unit. Finally, Barbie (like Josef Mengele), had some contact in South America with Friedrich (Federico) Schwend. Schwend had specialized during World War II in distributing forged British pounds to help finance intelligence operations of the Reich Security Main Office. Inmates at the Sachsenhausen concentration camp had been forced to produce such notes-a now well-known Nazi enterprise codenamed Operation Bernhard. But Schwend also claimed that he had worked for the Office of Strategic Services in 1945. (Barbie and Schwend, according to one CIA source, were involved in a plot to assassinate Victor Paz Estenssoro, leftist president of Bolivia who was ousted and forced into exile in Peru.) Despite such issues, the CIA continued to express confidence publicly and privately that the agency had no direct connection with Barbie.